I was a little rushed completing this week's Historical vs. Hollywood because I have been on book tour for most of the week, but I found very few inaccuracies in episode four. If I missed any big ones, please add them to the comment section. Henry has now got word of Reginald’s latest bestseller, Pro ecclesiasticae unitatis defensione where he called Henry a heretic, adulterer and a dirty barrel, among other things. In 1537, Reginald was causing a whole lot of raucous. He had received a warm welcome in Paris where he most likely tried to convince Francis to take action against Henry. This made Henry hopping mad so he wrote to his cousin Francis asking him for, ‘the deliverance of our rebel Reginald Pole.’ (1) Henry then sent his buddies, Sir Francis Bryan and Thomas Thirlby scrambling to France to basically negotiate kidnapping Reginald. (The Bishop of Verona referred to Bryan as one of Henry’s “principal mignons” indicating that he did not have much faith in Bryan’s diplomatic skills.) Just like in the Tudors, Francis refused to deliver Pole, but did promise to expel him within 10 days. Translation: don’t get me involved in your petty arguments cousin. Alas, Robert Aske is not so lucky. 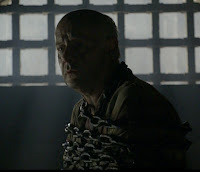 He is found guilty and is sentenced to hang in chains at the dungeon of Castle York. You might be thinking (as I was) why not just use a rope people? What is with the chains? Well, after some careful research into torture and executions, it turns out that traitors were often hanged in sturdier chains so that their skeletons could be left hanging for years and years. These mutilated corpses served as a public service announcement to the kids of England….just in case they were thinking of betraying their king. Flash to a gleeful Cromwell who is scribbling away at yet another letter. The letter in this scene was to Sir Thomas Wyatt in Spain and dated July 8th, 1537. Cromwell writes, “The traitors have been executed. The Lord Darcy at Tower Hill. The Lord Hussey at Lincoln. Aske hanged upon the dungeon of the Castle at York. The rest were executed at Tyburn. 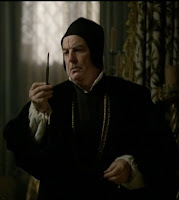 So that, as far as we can perceive, all the cankered hearts are weeded away.” The Tudors uses this letter word for word. Yey for real history! The next scene is either pointless or it is predicting one of Henry’s future love interests. The Lisle daughters (Katherine and Anne) are to be sent to Jane and she will choose one of the daughters as a lady-in-waiting. The daughter that she ends up choosing is rumored beauty, Anne Basset. Henry developed a close “friendship” with Anne and there was talk of a rumored affair after Jane’s death. The Tudors may possibly play up this affair in the next few episodes. Now that Jane is pregnant, Henry is petting her like a prized Chia pet. A dramatic scene follows where Jane invites Henry to feel the quickening of the baby. 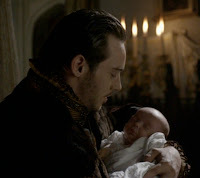 This scene is given so much attention because in Tudor times, a pregnancy was not considered viable until doctors could feel the baby move, usually by month four at the earliest. Before ultrasounds, you could pretty much have some really bad gas and mistake it for a healthy pregnancy…which better explains why phantom pregnancies were so common. Next we see Jane’s confinement at Hampton Palace and some truly harrowing birth scenes that would make any pregnant woman wish to be a gay male. (or at least I did.) We see Jane’s doctors begin to impatiently eye their knives as the birth drags on and on. Were Jane’s doctors really considering performing a Cesarean? In truth, Cesareans were rarely performed in the 16th century because it always led to the death of the mother. No evidence exists in any of the accounts of the prince’s birth that Henry considered such an operation so it is doubtful that even he could be so cruel. Still, this scene is not complete Hollywood rubbish. After Jane’s death, many ballads circulated throughout England containing rumors that Henry had killed his wife by ordering she be cut open. After two days and three nights, (about two minutes in Hollywood time) Jane finally gives birth to a healthy son on the eve of the Feast of St. Edward. (thus he is named Edward.) At the christening, Edward Seymour carried the Lady Elizabeth and Mary acted as one of the godparents. You might have been wondering why neither Jane nor Henry was at the christening, but it was not customary for royalty to attend. Queens had to actually endure a further confinement because they were still considered “dirty” after giving birth. Eight days after the christening, Jane went down quickly and her drastic change of health surprised everyone around her. Jane’s doctors reported that the queen had suffered a “natural lax”, or loosening of the bowels. Many historians have theorized that the placenta was not fully expelled after the birth and this led to an infection. In the days before antibiotics, there really was not much doctors could do to save a mother with puerperal fever. Often they would bleed the patient in a fever’s early stages by cutting a vein or applying leeches to the genital and buttocks. ( A procedure that sort of makes you feel guilty for complaining about hospital food.) Bloodletting did work to some degree in the early stages of infection by starving the staph bacteria, but was only effective in the first hours of a fever. Unfortunately, it took Jane’s doctors some time to figure out she was headed for the pearly gates. *The Bucentuar was also used in state ceremonies and carried Henry II of France in 1547 and Dogaress Morosina Morosini_Grimani in 1597. Sadly, the Bucentaur was destroyed by Napoleon in 1798 to symbolize his conquering of Venice. A project to restore it began in March of 2008. **ok if you can’t guess, the marriage negotiations fell through when Charles was unable to convince the Pope to grant a dispensation. Bernard, G. W. The King’s Reformation, Henry VIII and the Remaking of the English Court, New Haven, CT: Yale University Press, 2007. Fox, Julia. Jane Boleyn: The True Story of the Infamous Lady Rochford, New York, NY: Ballantine Books, 2009. LOVE this post! I tried, but I can't really get into The Tudors...but I won't need to with more posts like these! Excellent summary and I love the Chia pet remark =) You have such an awesome blog! Season Three hasn't captured my full attention...not like Seasons One and Two. Cathy of Aragon and Annie One are my two favorite wives of Henry's and their story one that has always held my interest. However, between this blog and various videos seen on YouTube, the admission has to be made that this latest batch of 'home movies' is really good. I appreciate how Henry is being portrayed...he seems to be slowly going mental and that takes a bigger acting effort than putting on a fat suit. Thanks for this blog, Carlyn. You've kept me up to date and I may just have to purchase Season Three after all! ooh, I bet that would be rough watching a renaissance birthing scene while being pregnant. I'm learning so much from reading this blog, and I don't have to pay for showtime! Thanks for the interesting analysis; it must take a lot of time to write this up. The part about being able to feel the baby definately makes sense, even though I'd never thought of it that way before. I read that article too. Starkey also called Henry VIII the "Tudor Obama." He is really umm...creative with the comparisons when he has a book to promote. I'm sure i read that Henry was by Jane's side when she was dying. He was going to leave her but then when he found out how close she was to death and so he stayed. It was in one of the books i read, i could have sworn it was Antonia Fraser. But it was a beautiful scene, ive never felt so sorry for Henry. And poor Jane, she was a good woman, she deserved to be happy. 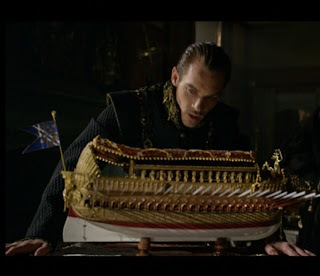 I am really enjoying "The Tudors"
but am looking forward to this episode I have not seen yet.